Historically the main areas of use for our Sidewinders® has been road widening and road haunch reconstruction. 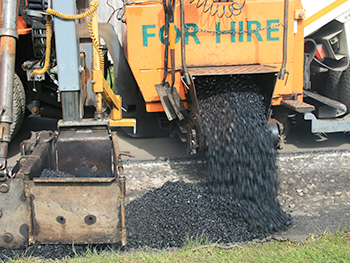 These operations have been carried out predominantly on A, B and C roads (including dual carriageways) at county level. Our Sidewinders® are equally suited to working within the trunk road network and local authority schemes both rural and urban. 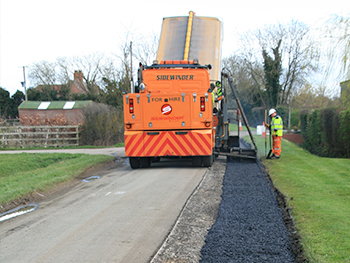 The versatility of our Sidewinders® permits the placing and grading of all levels of construction including granular capping and sub-base materials as well as hot base, binder and surface courses, crossing the boundary between civils and surfacing contractors alike. Equipped with up to date laser levelling and grade control our Sidewinders® produce surface tolerances equal to that of conventional pavers whilst out performing paving machine outputs in narrow inlays from 0.25 meters to 3.0 meters wide and down to in excess of 750mm below road. To find out more about our Road Haunching services contact us now. We will be happy to help and answer any questions you have.